Fox And The Whale was Shortlisted for the 90th Oscars and nominated at the 2018 Canadian Screen Awards for Best Animated Short . More information on Film Festivals/ Awards here. You can also watch the film over on YOUTUBE and FACEBOOK . Special Thanks to TIM NIELSEN who generously loaned the Field recordings / Sound library from which majority of the soundscape for the picture was designed. Fox and the Whale is my first Short film. It is an entirely self financed independent production made with personal savings. My little experiment made over the course of 16 months. The production part of the film was just myself and my girlfriend Kim Leow. Kim was the sole CG character animator on the piece, and i did everything else. I hope you will enjoy scrolling through this page and getting a little glimpse behind the making of this short film. I first started working on the film back in 2009. Development was often between freelance jobs. it was a process that stalled frequently. Apart from a handful of paintings it never went quite far. All that remains from those previous iterations is the title. The design of the Fox as a biped was a turning point for me. I was always drawn to the potential for abstraction in the character designs. At it's simplest, the Fox design is a distillation of the story . The fox is designed as an arrow looking for it's path forward. A compass trying to find it's true north. Originally i had conceived the film as all 2D. But being around my partner Kim, really warmed me to the idea of CG for the character animation. Slowly it took shape of a Hybrid project. Kim is an incredible animator. The limitation was always time and availability. The solution i chose was to design characters really rooted in simple silhouette, with the animation to be more based in physicality and pantomime than emotive/ dialogue driven performance. This kept production moving forward at a healthy pace. CG opened up a lot of potential for subtlety and nuance in mannerisms and the ability to iterate. All CG characters were built and rigged in Maya. The UV / texture was painted in Photoshop. I took time off from all commercial work for 16 months to make Fox And The Whale. Storyboarding on the current iteration of the film started in January 2015. I spent about three and half months purely boarding and editing. Boards were done in Photoshop with the edit in Premiere. I tried not to spend too much time doing concept art at this stage. These 4 paintings below was all i did. The intent was to capture a sense of place and lighting. I wanted to spend any effort on concept art diverted to the colour scripting. The Colour Script played a very important role in planning. I wanted to hit the major beats of the film, almost like keys in an animation sequence. This stage helped a lot once i was in the thick of production. I stayed as close as possible to the keys . There were a few shots that were replaced or edited out, but for the most part the film has maintained these initial colour beats. There was a specificity i was looking for. A lot of the inspiration came from a trip i took to Vancouver and Saltspring Island a few years back. The Pacific rainforest belt was always a big reference point for me. The hope was this stage would serve as the first ideas in creating a strong sense of place. This was the first compositing test in aftereffects . The idea behind the test was to see how the hybrid approach could work. The fox is animated in CG in Maya. The little moths are animated in 2D in Photoshop. The visual effects for the film, like fire, water, particles etc were achieved using AfterEffects. Most of these were done using plugins from Redgiant , called Trapcode. The choice with aftereffects was partly guided by my familiarity of the UI from being a longtime photoshop user. Also Creative cloud was a more affordable option for production. The learning curve was much smaller and all the packages from design through final render worked really great with each other. Oddly enough one of the hardest sequences was this end scene among the bones. When i started working on the film, i was sure the most time consuming shots would be water, or some other effects scene, that would really hit a technical wall. When i look back at production, this was the sequence i spent the longest time on. Technically the least complex scene, but what made it hard was getting the idea of bones convincingly across. It took a while to really get the paintings and backgrounds right. The reference i would keep going back to was the colour keys . 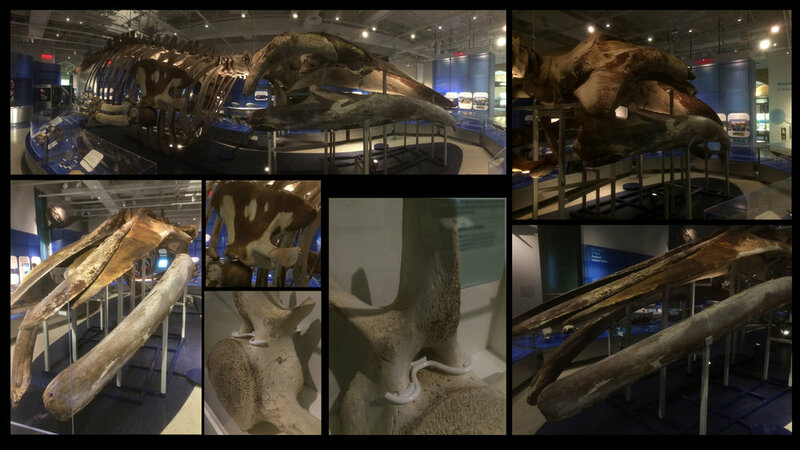 On a brief visit to the Canadian Museum of Nature in Ottawa, I stumbled into the room where the BlueWhale skeleton was mounted. Kim spotted this , on our way out from another exhibit . It was a total happy accident. I spent the next few hours studying and taking enough reference. That really became my jumping-off point for the final solve of the background paintings. Stills from the Bone Sequence in the final film. A small note about software and hardware end of things. The film was entirely made from preproduction through post in my home studio, using commercially available software and hardware. Color management and workflow on the software side was maintained through Adobe. On the hardware end, i was using HP Dreamcolor Z27x for colour accuracy through final render. Foley was recorded using a Zoom H5. Sound design was done using a pair of JBL LSR305's . Fox and the Whale was a very independent production. As i mentioned above, It was entirely self financed from my personal savings. If you are interested in supporting this indie project, you can pick up the Art of Fox And the Whale Package via Gumroad. The Art of book goes more in-depth into the production of this indie film. The Gumroad package comes with the Art of book PDF, Storyboards PDF, the full film in 2K resolution, Layered PSD background painting, Colour Script and screensavers. I hope you enjoy the book and the film! COPYRIGHT © 2019, ROBIN JOSEPH. ALL RIGHTS RESERVED.